These fun pyjama shorts feature a fine blue stripe with an elephant jacquard woven into the fabric. 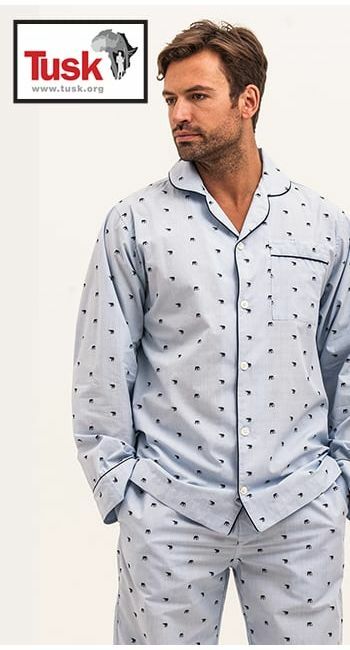 Pyjama set available in the same fabric, along with matching men's and children's nightwear. Fabric type: Classic cotton with a jacquard weave. We are delighted to announce that for every pair of Tembo pyjamas you buy, we will be donating £10 to Tusk Trust - a pioneering organisation that invests in the future of Africa; protecting wildlife, supporting communities and promoting education. (For those of you who are wondering, tembo is Swahili for elephant! ).